What You Need to Know: For the first time in what seems like weeks [EDITOR’S NOTE: It has been weeks. ], the Cubs brought their bats. In fact, the offense was humming. The Cubs clobbered a pair of two-run homers, a pair of three-run homers, and a two-run double, backing Marlins starter Jarlin García into a corner from the outset and knocking him out of the game after only four innings. Kyle Hendricks didn’t have his best stuff or command, as hitters early on made some very hard contact but he didn’t need it—all those balls found fielders’ gloves, and Hendricks cruised through eight innings. Next Level: Before this game, the Cubs had hit 13 solo home runs in a row without a multi-run dinger, dating all the way back to April 20th. 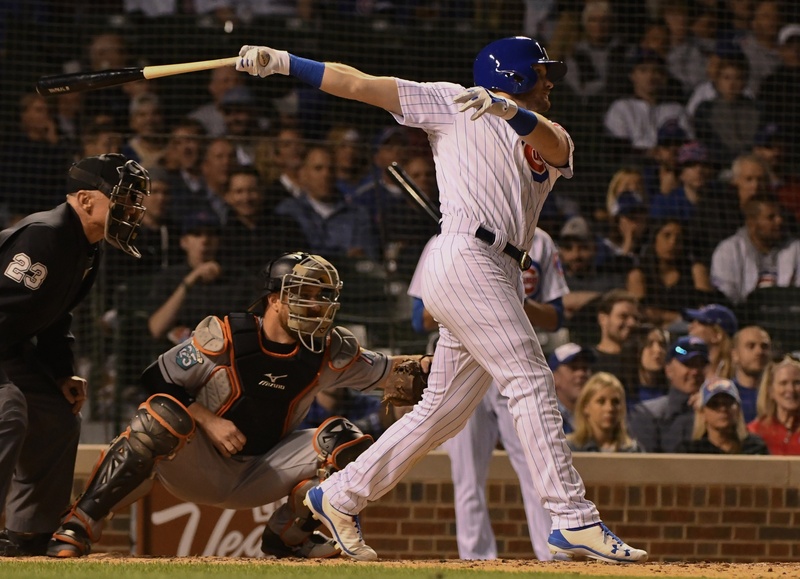 Tonight, they smoked four pitches into the Wrigley Field night, headlined by two from Ian Happ. Heading into the game, Happ was hitting a paltry .228/.291/.380, while striking out at an alarming 45 percent clip. He had not found many starts due to his cold beginning to the season, and, as the rest of the Cubs’ bats went silent over the past week, Happ’s presence did little to help. Tonight, though, he hit a home run from either side of the plate—the first time a Cubs hitter had accomplished that feat since Dioner Navarro’s improbable three-homer game against the White Sox in 2013. Impressively, Happ hit his right-handed homer to dead center; his subsequent left-handed homer was a laser to the opposite field. Happ did sandwich his first homer with a pair of strikeouts, both on four pitches, but if the power shows up, the strikeouts are much more palatable. The problem is, perhaps obviously, that the strikeouts have encouraged opposing pitchers to throw more and more pitches out of Happ’s wheelhouse. More to come on Happ’s performance in the coming week here at BP Wrigleyville. Top Play (WPA): On a night full of big homers, the game’s first was the most important. After Ben Zobrist worked a walk from García, Kris Bryant squared off against the Marlins righty. Bryant has been the Cubs’ sole steady performer at the plate, and the blue-eyed superstar has managed to reach another level of performance once again as he has cut his strikeout percentage to 15 percent even as the rest of the league’s strikeout rates have ballooned (league average this year is 22.7 percent so far). Bryant turned on a 1-2, waist-high fastball, parking it several rows back into the left-field bleachers (+.165). It was Bryant’s 99th career homer, and boosting OPS to .973. Bottom Play (WPA): In true blowout fashion, the Cubs’ bottom play on the evening was a fairly inconsequential Bryant strikeout in the third inning with runners at the corners (-.039). It was actually a somewhat frustrating at-bat, with Bryant getting ahead 3-0 before taking three consecutive fastballs in the zone. Luckily Báez came through for the Cubs in the very next at-bat, hitting a monster three-run homer to center field for his team-leading 10th on the season. Up Next: Following Hendricks’s eight-inning outing, the Cubs have the luxury of using their bullpen liberally on Tuesday, and they might need it: Tuesday’s scheduled starter, Yu Darvish, has a flu virus and was placed on the disabled list before Monday’s game. The Cubs need to choose a starter to replace him, and with Jen-Ho Tseng scratched from Monday’s Iowa Cubs start, there’s a good chance Tseng gets the ball. Whoever pitches for the Cubs will face José Ureña, the Marlins’ Opening Day starter who has struggled in seven starts. Let’s keep the bats rolling, eh?